Pom Pom Quarterly co-founders and editors Lydia Gluck and Meghan Fernandes. This is the fourth in a series of blog posts with the generous sponsors of the 2016 Rhinebeck Trunk Show. Although I run a knitting website, I still do a lot of writing for print, and so I have always appreciated the joy of flipping through a paper publication. 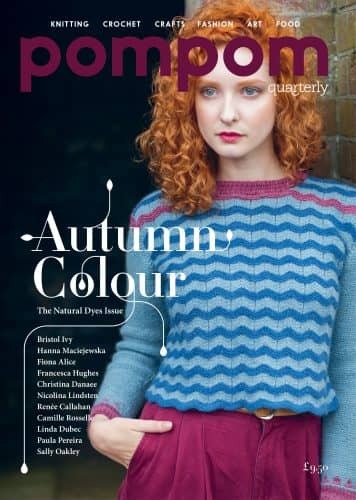 When it comes to knitting magazines, Pom Pom Quarterly is by far one of my favorites. It has the feel of a small book and features beautiful patterns (my Waterlily, a design by co-founder and editor Meghan Fernandes, is one of my favorite garments), gorgeous photographs and illustrations and unique articles, such as a recent one on the science behind dyes. Tell me all about how Pom Pom Quarterly got started. Meghan + Lydia: We met while working at Loop, the gorgeous knitting shop in London, and found we had a shared love of knitting and craft, and of magazines too! 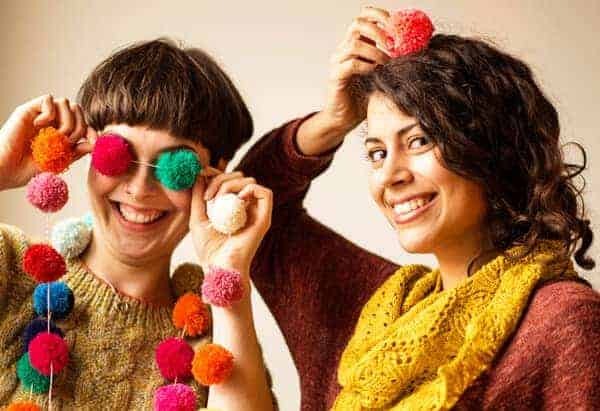 We both felt that there wasn’t a knitting magazine around at the time that really spoke to us, or reflected the way we felt about craft and the plethora of indie dyers that had sprung up around the resurgence of interest in knitting and crochet. We decided to have a go ourselves at creating the publication we felt was missing, and after brainstorming in cafes and pubs the idea for Pom Pom was born. We designed all the patterns and wrote all the articles, friends helped out with modelling, photography and design, and somehow it all came together into a magazine we loved. We were so happy that other people loved it too! Now we are a slightly bigger operation of course, and work with designers, editors and writers and all sorts of brilliant people to make Pom Pom. Why did you decide to go the print route? 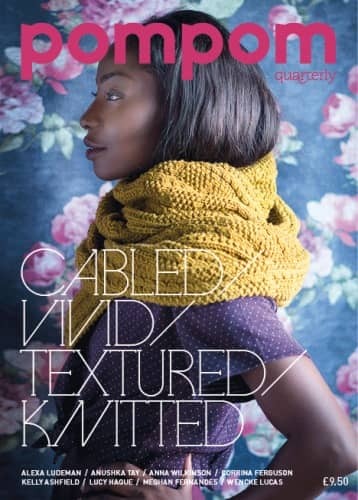 Meghan + Lydia: We decided on print because we both love owning a beautiful magazine as a physical object, and we suspected that other knitters would feel similarly. It makes sense that people who spend time making lovely handcrafted things would appreciate the paper and quality of printing, and the fact that the magazine is printed in the UK. Because the mag is quarterly we think of it as collectible, and we try to make each issue timeless. For that reason we have no off sale date (until they sell out of course! ), and we think of our print copies as little treats for knitters and crocheters, an investment that they will return to time and again… Of course we have digital versions available too for those who like wrinkle proof pages! What would you say are the most important skills that each of you bring to the magazine? Lydia: Meghan says I have good business sense, and I think she has a real knack for innovation. She is always the one wanting to mix things up and try new things, whereas I tend to get stuck in my ways. Meghan has tended toward the social media side of things, she always knows about what’s going on in the craft world way before I do! I am often happier hanging out with Excel, but we both love to chat and meet new people, which definitely comes in handy for what we do! We’ve both learned so much in the last five years, and I think we can both safely say we feel more confident now as stylists and editors. The one thing we definitely bring is enthusiasm for craft, and a love of print as a medium. Lydia: I learned to knit from a book one rainy Welsh summer about 10 years ago. A housemate of mine at university was a knitter, and after seeing her making things I was inspired, and decided that if I was stuck indoors while the weather was bad I might as well learn something new! Meghan: My boyfriend’s mom taught me to knit when I was a teenager. I got really lucky because she was a great teacher and even bought me a sweater’s worth of yarn for my first project as a birthday present. Lydia: Oh there are so many I love! I think Viola is definitely a favourite, and Uncommon Thread, Shilasdair and MadelineTosh… and I have always been a fan of Old Maiden Aunt too. But there really are so many brilliant dyers out there! Meghan: They are changing all the time, and there are too many to count, but I love The Uncommon Thread, Camellia Fiber Company and Julie Asselin a lot at the moment. Lydia: Hmmm, really memorable ones would probably be disasters like the first jumper I ever made, which did not fit the intended recipient. But memorable successes are the first pattern I ever wrote, my Overbury mitts from the first issue of Pom Pom, and my Quadrillion jumper, which was Meghan’s design, and is still my favourite jumper. Meghan: My most memorable is probably so because it’s my most worn — my Beatnik sweater by Norah Gaughan. I remember finally getting to grips with cables on that project and having to drop and correct cabled stitches for the first time. It’s so wearable and classic Norah — timeless, clever and so wearable. 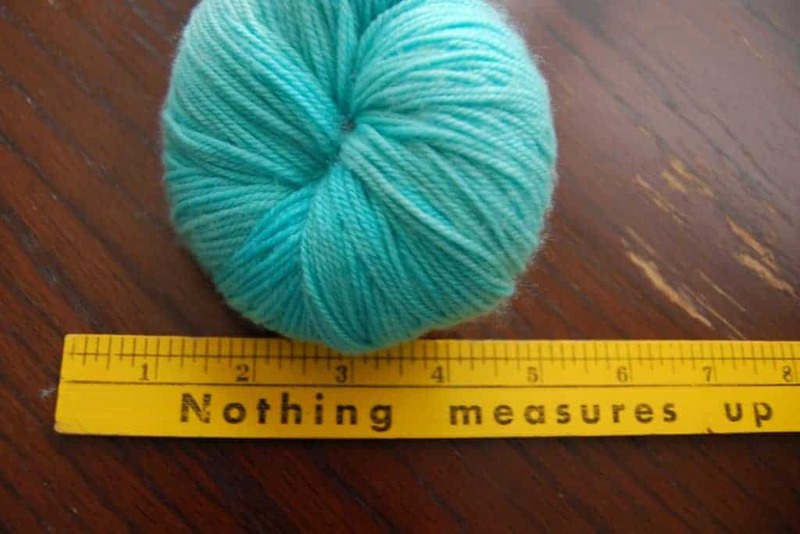 Which crafts, in addition to knitting, do you enjoy? Lydia: I also crochet, and do a little embroidery from time to time, but I’ll have a go at anything! If darkroom photography counts then that is definitely a craft I was very into when I had access to a darkroom! I just loved the magic of seeing the image appear. Without a darkroom on hand I have been experimenting with cyanotypes, which are so easy! Meghan: In addition to knitting, I love crocheting and calligraphy, and recently I learned to weave which is such a cool way to use the amazing yarns we have access to. What is your favorite music to knit or craft to? Lydia: Oh wow, I don’t know if I can pick a favourite. But recently I have been crafting to Emmlylou Harris, Joanna Newsom and Sia. Patty Smith and The Velvet Underground have always been big favourites of mine too. When I tried to do some sewing a few years ago I was really into The Moldy Peaches and Jeffrey Lewis so they always remind me of threading a sewing machine. When I’m drawing I have to listen to something with a beat. Meghan: Like favourite indie dyers, the music I enjoy knitting to changes all the time too. In the iTunes/Spotify age, I still love listening to the radio — the station KUTX in Austin is a fave, as is the UK-based BBC Radio 6 which I still love to listen to two years after having moved away! This entry was posted in Q&A, Rhinebeck trunk show, Sponsored post and tagged indies, interview, magazines, patterns, publishing, rhinebeck, rhinebeck trunk show, yarn.